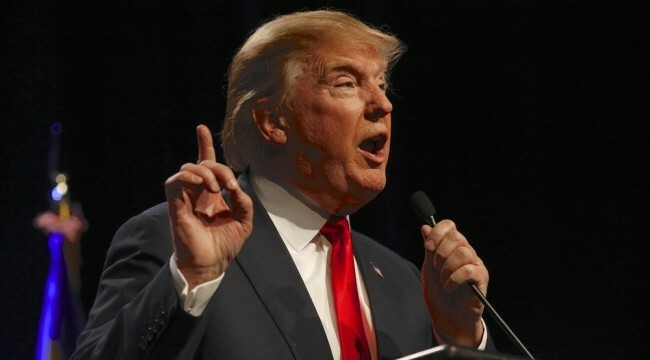 Donald Trump’s patented phrase “we aren’t winning anymore” lies beneath the tidal wave of anti-establishment sentiment propelling his campaign and, to some considerable degree, that of Bernie Sanders, too. As we demonstrated in Part 1, what’s winning is Washington, Wall Street and the bicoastal elites. The latter prosper from finance, the LA and SF branches of entertainment ( movies/TV and social media, respectively) and the great rackets of the Imperial City—including the military/industrial/surveillance complex, the health and education cartels, the plaintiffs and patent bar, the tax loophole farmers and the endless lesser K-Street racketeers. But most of America’s vast flyover zone has been left behind. Thus, the bottom 90% of families have no more real net worth today than they had 30 years ago and earn lower real household incomes and wages than they did 25 years ago. Needless to say, the lack of good jobs lies at the bottom of the wealth and income drought on main street, and this week’s April jobs report provided still another reminder. During the last three months goods-producing jobs have been shrinking again, even as the next recession knocks on the door. These manufacturing, construction and energy/mining jobs are the highest paying in the US economy and average about $56,000 per year in cash wages. Yet it appears that the 30 year pattern shown in the graph below——lower lows and lower highs with each business cycle—-is playing out once again. So even as the broadest measure of the stock market—-the Wilshire 5000—–stands at 11X its 1989 level, there are actually 22% fewer goods producing jobs in the US than there were way back then. This begs the question, therefore, as to the rationale for the Jobs Deal we referenced in Part 1, and why Donald Trump should embrace a massive swap of the existing corporate and payroll taxes for new levies on consumption and imports. The short answer is that Greenspan made a giant policy mistake 25 years ago that has left main street households buried in debt and stranded with a simultaneous plague of stagnant real incomes and uncompetitively high nominal wages. It happened because at the time that Mr. Deng launched China’s great mercantilist export machine during the early 1990s, Alan Greenspan was more interested in being the toast of Washington than he was in adhering to his lifelong convictions about the requisites of sound money. So what would have happened in response to the so-called “china price” under a regime of sound money in the US? The Fed’s Keynesian economists and their Wall Street megaphones would never breath a word of it, of course, because they have a vested interest in perpetuating inflation. It gives inflation targeting central bankers the pretext for massive intrusion in the financial markets and Wall Street speculators endless bubble finance windfalls. But the truth is, sound money would have led to falling consumer prices, high interest rates and an upsurge of household savings in response to strong rewards for deferring current consumption. From that enhanced flow of honest domestic savings the supply side of the American economy could have been rebuilt with capital and technology designed to shrink costs and catalyze productivity. But instead of consumer price deflation and a savings-based era of supply side reinvestment, the Greenspan Fed opted for a comprehensive Inflation Regime. That is, sustained inflation of consumer prices and nominal wages, massive inflation of household debt and stupendous inflation of financial assets. To be sure, the double-talking Greenspan actually bragged about his prowess in generating something he called “disinflation”. But that’s a weasel word. What he meant, in fact, was that the purchasing power of increasingly uncompetitive nominal American wages was being reduced slightly less rapidly than it had been in the 1980s. Still, the consumer price level has more than doubled since 1987, meaning that prices of goods and services have risen at 2.5% per year on average. 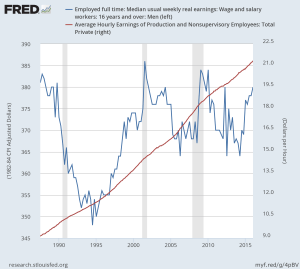 Notwithstanding all the Fed’s palaver about “low-flation” and undershooting its phony 2% target, American workers have had to push their nominal wages higher and higher just to keep up with the cost of living. But in a free trade economy the wage-price inflation treadmill of the Greenspan/Fed was catastrophic. It drove a wider and wider wedge between US wage rates and the marginal source of goods and services supply in the global economy. That is, US production was originally off-shored owing to the China Price with respect to manufactured goods. But with the passage of time and spread of the central bank driven global credit boom, goods and services were off-shored to places all over the EM. The high nominal price of US labor enabled the India Price, for example, to capture massive amounts of call center activity, engineering and architectural support services, financial company back office activity and much more. At the end of the day, it was the Greenspan Fed which hollowed out the American economy. Without the massive and continuous inflation it injected into the US economy, nominal wages would have been far lower, and on the margin far more competitive with the off-shore. That’s because there is a significant cost per labor hour premium for off-shoring. The 12,000 mile supply pipeline gives rise to heavy transportation charges, logistics control and complexity, increased inventory carry in the supply chain, quality control and reputation protection expenses, lower average productivity per worker, product delivery and interruption risk and much more. In a sound money economy of falling nominal wages and even more rapidly falling consumer prices, American workers would have had a fighting chance to remain competitive, given this significant off-shoring premium. But the demand-side Keynesians running policy at the Fed and US treasury didn’t even notice that their wage and price inflation policy functioned to override the off-shoring premium, and to thereby send American production and jobs fleeing abroad. 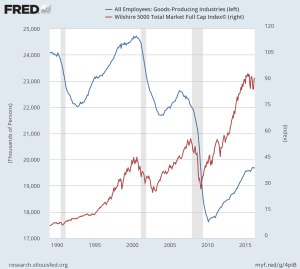 Indeed, they actually managed to twist this heavy outflow of goods and services production into what they claimed to be an economic welfare gain in the form of higher corporate profits and lower consumer costs. Needless to say, the basic law of economics—-Say’s Law of Supply—-says societal welfare and wealth arise from production; spending and demand follow output and income. By contrast, our Keynesian central bankers claim prosperity flows from spending, and they had a ready solution for the gap in spending that initially resulted when jobs and incomes were sent off-shore. The de facto solution of the Greenspan Fed was to supplant the organic spending power of lost production and wages with a simulacrum of demand issuing from an immense and contiunuous run-up of household debt. Accordingly, what had been a steady 75-80% ratio of household debt to wage and salary income before 1980 erupted to 220% by the time of Peak Debt in 2007. The nexus between household debt inflation and the explosion of Chinese imports is hard to miss. Today monthly Chinese imports are 75X largerthan the were when Greenspan took office in August 1987. At the same time, American households have buried themselves in debt, which has rising from $2.7 trillion or about 80% of wage and salary income to $14.2 trillion. 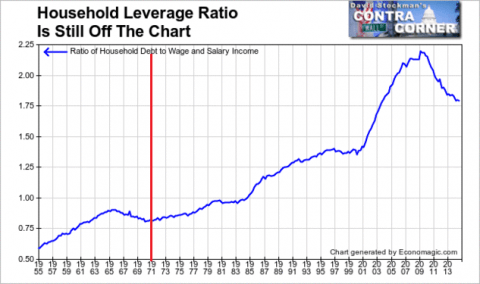 Even after the financial crisis and supposed resulting deleveraging, the household leverage ratio is still in the nosebleed section of history at 180% of wage and salary earnings. 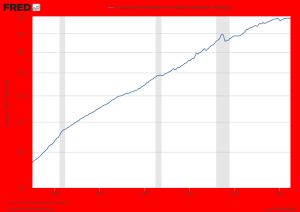 Stated differently, had the household leverage ratio not been levitated in the nearly parabolic fashion shown below, total household debt at the time of the financial crisis would have been $6 trillion, not $14 trillion. In effect, the inflationary policies of the Greenspan Fed and its successors created a giant hole in the supply side of the US economy, and then filled it with $8 trillionof incremental debt which remains an albatross on the main street economy to this day. Then again, digging holes and refilling them is the essence of Keynesian economics. At the end of the day, the only policy compatible with Greenspan’s inflationary monetary regime was reversion to completely managed trade and a shift to historically high tariffs on imported goods and services. That would have dramatically slowed the off-shoring of production, and actually also would have remained faithful to the Great Thinker’s economics. After all, in 1931 Keynes turned into a vociferous protectionist and even wrote an ode to the virtues of “homespun goods”. In perverse fashion, therefore, the Greenspan Fed operated a bread and circuses economy. Unlimited imports massively displaced domestic production and incomes—even as they imposed an upper boundary on the rate of CPI gains. The China Price for goods and India Price for services, in effect, throttled domestic inflation and prevented a runaway inflationary spiral. 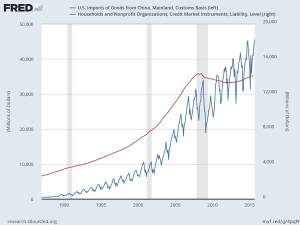 The ever increasing debt-funded US household demand for goods and services, therefore, was channeled into import purchases which drew upon virtually unlimited labor and production supply available from the rice paddies and agricultural villages of the EM. In a word, the Fed’s monetary inflation was exported. In any event, the graph below nails the story. During the 29 years since Greenspan took office, the nominal wages of domestic production workers have soared, rising from $9.22 per hour in August 1987 to $21.26per hour at present. It was this 2.3X leap in nominal wages, of course, that sent jobs packing for China, India and the EM. That’s right. There were tens of millions of jobs off-shored, but in constant dollars of purchasing power, the average production worker wage of $383 per week in mid-1987 has ended up at $380per week 29 years later. During the span of that 29 year period the Fed’s balance sheet grew from $200billion to $4.5 trillion. That’s a 23Xgain during less than an average working lifetime. Greenspan claimed he was the nation’s savior for getting the CPI inflation rate down to around 2% during his tenure; and Bernanke and Yellen have postured as would be saviors owing to their strenuous money pumping efforts to keep it from failing the target from below. But 2% inflation is a fundamental Keynesian fallacy, and the massive central bank balance sheet explosion which fueled it is the greatest monetary travesty in history. Dunderheads like Bernanke and Yellen say 2% inflation is just fine because under their benign monetary management everything comes out in the wash at the end——-wages, prices, rents, profits, living costs and indexed social benefits all march higher together with tolerable leads and lags. No they don’t. Jobs in their millions march away to the off-shore world when nominal wages double and the purchasing power of the dollar is cut in half over 29 years. These academic fools apparently believe they live in Keynes’ imaginary homespun economy of 1931! The evident economic distress in the flyover zone of America and the Trump voters now arising from it in their tens of millions are telling establishment policy makers that they are full of it; that they have had enough of free trade and free money. The solution lies in the contra-factual to the Greenspan/Fed Inflation Regime. Under sound money, the balance sheet of the Fed would still be $200 billion, household debt would be a fraction of its current level, the CPI would have shrunk 1-2% per year rather than the opposite and nominal wages would have shrunk by slightly less. Under those circumstances, there would have been no explosion of US imports because US suppliers would have remained far more competitive and domestic demand for goods and services far more subdued. To wit, what amounts to a statistical Trump Tower in our trade accounts——where total imports exploded by 6X——- couldn’t have happened under a regime of sound money. For instance, if the CPI had shrunk by 1.5% annually since 1987 and nominal wages by 0.5%, the average nominal production wage today would be $8 per hour, meaning that American labor would be dramatically more competitive in the world economy versus the EM Price than it currently is at $22 per hour. But real wages would be far higher at $500 per week compared to the actual of $380 per week shown above. At the same time, solid breadwinner jobs in both goods and services would be far more plentiful than reported last Friday by the BLS. 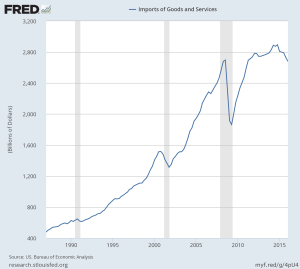 Needless to say, the clock cannot be turned back, and a resort to Keynes’ out-and-out protectionism in the context of an economy that suckles on nearly $3 trillion of annual goods and services imports is a non-starter. It would wreak havoc beyond imagination. But it is not too late to attempt the second best in the face of the giant historical detour from sound money that has soured the practice of free trade. To wit, public policy can undo some of the damage by sharply lowering the nominal price of domestic wages and salariesin order to reduce the cost wedge versus the rest of the world. It is currently estimated that during 2016 Federal social insurance levies on employers and employees will add a staggering $1.1 trillionto the US wage bill. Most of that represents social security and medicare payroll taxes. The single greatest things that could be done to shrink the Greenspan/Fed nominal wage wedge, therefore, is to rapidly phase out all Federal payroll taxes, and thereby dramatically improve the terms of US labor trade with China and the rest of the EM world. Given that the nation’s total wage bill (including benefit costs) is about $10 trillion, elimination of Federal payroll taxes would amount to a 11% cut in the cost of US labor. On the one hand, such a bold move would dramatically elevate main street take-home pay owing to the fact that half of the payroll tax levy is extracted from worker pay packets in advance. In the case of a rust belt industrial worker making $25 per hour, for example, it would amount to an additional $4,000 per year in take home pay. Moreover, elimination of payroll taxes would be far more efficacious from a political point of view in Trump’s flyover zone constituencies than traditional Reaganite income tax rate cuts. That’s because nearly 160 million Americans pay social insurance taxes compared to less than 50 million who actually pay any net Federal income taxes after deductions and credits. At the same time, elimination of the employer share of Federal payroll taxes would reduce the direct cost of labor to domestic business by upwards of $575 billionper year. And as we have proposed in the Jobs Deal, the simultaneous elimination of the corporate income taxwould reduce the burden on business by another $350 billion annually. By all fair accounts, the corporate income tax is the most irrational and unproductive element of the US tax code. But as I learned working on its replacement as a young aid on Capitol Hill in the early 1970s, it gets demagogued by the political left and harvested for loopholes by the K-Street lobbies in a never ending and pointless legislative joust. Needless to say, that is a mighty force of inertia, and in that sense is emblematic of why the status quo is failing. It is no secret that the corporate tax has always posed an insuperable challenge to match business income and expense during any arbitrary tax period, but that in a globalized economy in which capital is infinitely mobile on paper as well as in fact, the attempt to collect corporate profits taxes in one country has become pointless and impossible. It simply gives rise to massive accounting and legal maneuvers such as the headline grapping tax inversions of recent years. Yet notwithstanding 75,000 pages of IRS code and multiples more of that in tax rulings and litigation, corporate tax departments will always remain one step ahead of the IRS. That is, the corporate tax generates immense deadweight economic costs and dislocation—including a huge boost to off-shoring of production to low tax havens——while generating a meager harvest of actual revenues. Last year, for example, corporate tax collections amounted to just 1.8% of GDP compared to upwards of 9% during the heyday of the American industrial economy during the 1950s. By pairing elimination of the corporate tax with a giant increase in worker take-home pay, however, the Donald might actually make some progress where the GOP has tilted at windmills for decades. Needless to say, you don’t have to be a believer in supply side miracles to agree that a nearly $1 trillion tax cut on American business from the elimination of payroll and corporate income taxes would amount to the mother of all jobs stimulus programs! Self-evidently, the approximate $1.5 trillion revenue loss at the Federal level from eliminating these taxes would need to be replaced. We are not advocating any Laffer Curve miracles here——although over time the re-shoring of jobs that would result from this 11% labor tax cut would surely generate a higher rate of growth than the anemic 1.3% annual GDP growth rate the nation has experienced since the turn of the century. In the next section we will delve deeper into the tax swap proposed here. But suffice it to say that with $3 trillion of imported goods and services and $10 trillion of total household consumption, the thing to tax would be exactly what we have too much of and which is the invalid fruit of inflationary monetary policy in the first place. To wit, foregone payroll and corporate tax revenue should be extracted from imports, consumption and foreign oil. An approximate 15% value added tax and a variable levy designed to peg landed crude prices at $75 per barrel would more than do the job. And revive the US shale patch, too.